Silas: Don't even think about it. Those girls only know three words: 'stop,' 'don't,' and "no." Those looking for depth and meaning in How High would most likely be better off looking elsewhere. There is little in the way of a cohesive structure and there really is nothing resembling a central plot point, but for the sake of being thorough, here is the script in a nutshell. 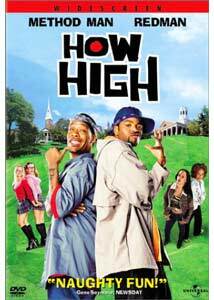 Silas (Method Man) and Jamal (Redman) are a pair of New Jersey stoners who have little to no ambition to attend college. On a whim, the two take a college entrance exam and pass with flying colors, thanks in part to the appearance of a ghost-like figure the two can see only while high. By receiving record numbers on the test, the two are granted access to any college in America, including Harvard, where the two eventually end up taking classes. As is to be expected, Jamal and Silas turn the prestigious university upside down and chaos ensues. Not exactly James Joyce or William Faulkner material, is it? With the limita of good taste having been blurred in the past few years, it seems as though many films are crossing the line without blinking. From lewd acts done to pastry products as well as other assorted jokes about bodily fluids, it seems as though each film is continually trying to outdo another in a sort of vicious circle. With this knowledge, it should come as no real surprise that the events that transpire in How High are quite possibly as out there as one is likely to see. For instance, in what other film can one find the fictional Vice President hamming it up while inhaling a large amount of marijuana, or a respected dean, under the influence of marijuana, livening up a stodgy university party? While these events are far from being overly obscene, they are truly surprising at first glance, though sadly seem only to exist in an effort to shock the viewer, adding nothing to the overall story arc. While it can be assumed that the filmmakers were not under any orders to make the world a better place, there is little to deny that the film never really goes anywhere even remotely interesting. Overall, it feels uncomfortably vacant, as if the script were cobbled together from isolated ideas, including several characters and situations that fail to appear remotely connected to the storyline. Screenwriter Dustin Lee Abraham seems to have a difficult time introducing characters that have depth, as only Silas and Jamal show any sort of development beyond stereotypes. From an overly arrogant suitor battling with Silas for the affections of an attractive co-ed to the dean who would like to see Jamal and Silas out of school, the rest of the characters could have been bought at a stereotype fire sale. Director Jesse Dylan (his dad is some famous singer...) does try to make things work, but his direction feels uninspired and his visual style lacks the sort of creativity needed to spice up the dull screenplay. The saving grace of the film, aside from a few spotty moments of genuinely inspired humor, comes from the performances given by hip hop stars Method Man and Redman. The two have such terrific chemistry that their scenes come off lively and full of such abundant energy, leaving the scenes without them painfully lacking. The supporting cast is comprised of overly talented comedic actors, including a nice performance by Fred Willard, who is rightfully making a name for himself after his standout performance in Best of Show. Other supporting performances by Obba Babatunde and Lark Vorhees are pretty much one-note, while Spaulding Gray is very funny as a professor that feels as though he has a bond with Silas and Jamal. Image Transfer Review: Presented in a 1.85:1 anamorphic widescreen transfer How High looks terrific from beginning to end. The beginning of the film offers a subdued color palette with the harsh tones of New Jersey, but once the scenery shifts to Harvard, the film is spilling over with vibrant colors. The bright crimson and autumn tones look terrific; there is little bleeding evident and sharpness and detail are consistently spot on. I noticed some small instances where edge enhancement was noticeable, but not enough to bring the overall quality of the transfer down. A fine transfer from Universal. Audio Transfer Review: Sporting both a Dolby Digital 5.1 mix as well as a DTS track, How High offers little in the way of showy effects, but with the largely hip hop soundtrack the .1 LFE track does come off nicely. Dialogue is clean throughout with little distortion, while the surround speakers do a nice job of adding ambient sounds. For the most part though, this is a restrained track that, without the presence of the musical score, would be just another comedy mix. In a face-off between the two, the DTS track proved to be better defined than the Dolby Digital track. The differences were small, so the victory for the DTS track is a minor one. Extras Review: While not labeled a special edition, How High offers more in the way of extra features than other recent Universal labelled as such. First is a commentary by actors Method Man and Redman, and while the track offers no real insight into the filmmaking process, it certainly is often hysterically funny. Aside from the fact that the two often repeat the same anecdote several times, or that Method Man routinely points out little sight gags (such as hitting an extra on the head), the track moves quickly with very few silent gaps. The two obviously get along very well and it shows on the track. WTHC presents the Making of How High, a nearly half-hour-long look at the making of the film that aired on BET at the time of the film's release. Featuring interviews with nearly everyone involved, this documentary is funny and worth a look. Danny DeVito even pops up and announces the fact that there are "ho's in the movie". A selection of deleted scenes is offered and while they are presented in a widescreen aspect ratio, the fact that there is no indexing available is very frustrating. The scenes are grouped together with no clean break from one scene to another, so it is difficult to determine when a scene ends and a new one begins. From what I could tell, there are twenty-one cut scenes available for viewing, though this may not be an accurate number. The scenes work for the most part, but it is obvious that several were removed for pacing reasons. Some scenes are simply extensions of existing scenes. A collection of outtakes runs nearly three minutes and is mainly a montage of each of the actors laughing at mistakes. Two music videos are offered, one for Part II by Method Man and Redman as well as Round and Round Remix by Jonell and Method Man. These are not my cup of tea, but hey, they might be yours. Trailers for How High, American Pie, American Pie 2, Fast Times At Ridgemont High, 8 Mile, Undercover Brother are available. As a side note, the trailer for 8 Mile is the highlight of the disc for me, as this film, in my opinion, looks amazing. Cast and crew bios, production notes and a weblink to Universal Home Video are included. Finally, the disc also includes a "Hide the Stash" game where the viewer searches for a hidden easter egg on the numerous menu screen on the disc. I became frustrated only a few minutes in and failed to locate the stash, so better luck to those who make more of an effort than I did. When it comes down to whether or not How High is a funny film, the answer will likely depend on your state of mind. The DVD is packed with extra features as well as nice video and audio portions. For fans of the two lead actors this is a must buy, but sadly, for those just looking for a laugh, How High just doesn't make the grade.